Exhibiting at events and exhibitions can be hugely beneficial to generating new leads and raising awareness of your business. With often hundreds of different companies exhibiting at an event, you need to have something to set your company apart from the rest to draw in visitors, engage with them for longer periods of time, and increase your chances of turning visitors into leads. The first point of call is obviously making sure your stand is attractive and well designed to catch the eye of passer-by’s. Our exhibition stand category offers endless inspiration for well-designed stands that create results. Once visitors are attracted to your stand, it’s time to think of an exhibition competition or giveaway that entices visitors to stay on your stand for longer, allowing you to engage with them for longer and turn them into potential leads. With the emerging digital world, competitions and giveaways are becoming an even more appealing tactic for driving engagement at events. Once you have decided on the competition you want to offer, you should promote it prior to the event on your social platforms. This creates a buzz and gives people an incentive to visit your stand before the event has even started. We have compiled a list of great exhibition competitions, for every budget, which are sure to attract visitors both on the day of your event and provide an incentive prior to the event. - A classic old school exhibition competition which is simple to set up and sure to create some friendly competition among attendees. Simply fill a jar with a variety of different sized and shaped sweets or chocolates and ask visitors to guess how many sweets are in the jar. Create an answer sheet where visitors must give their name, their guess and their email address for a chance to win. You can then use their email addresses for your email marketing efforts. For a recent exhibition, we created a ‘Wheel of Fortune’ style competition where visitors had to correctly answer a riddle in order to spin our wheel of fortune and win a prize. This interactive activity engaged visitors in our stand whilst also attracting people to our stand to see what the commotion was about. This competition was more of an instant one rather than a continued one throughout the event where a winner would be revealed at the end of the event. 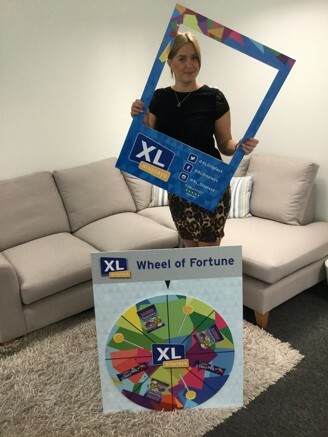 For information on how we could help create your own wheel of fortune – contact us or call our sales team on 01733 511030. - This is a great event competition for events and exhibitions. Simply ask visitors to balance a coin on a floating object like a floating apple. The person who can balance the coin the longest amount of time, without the object or coin sinking, is the winner. Create a leaderboard and ask visitors for their contact details in case they are the winner of the dedicated prize. This competition lengthens the time that visitors spend on your stand to create more time for creating a rapport with visitors. 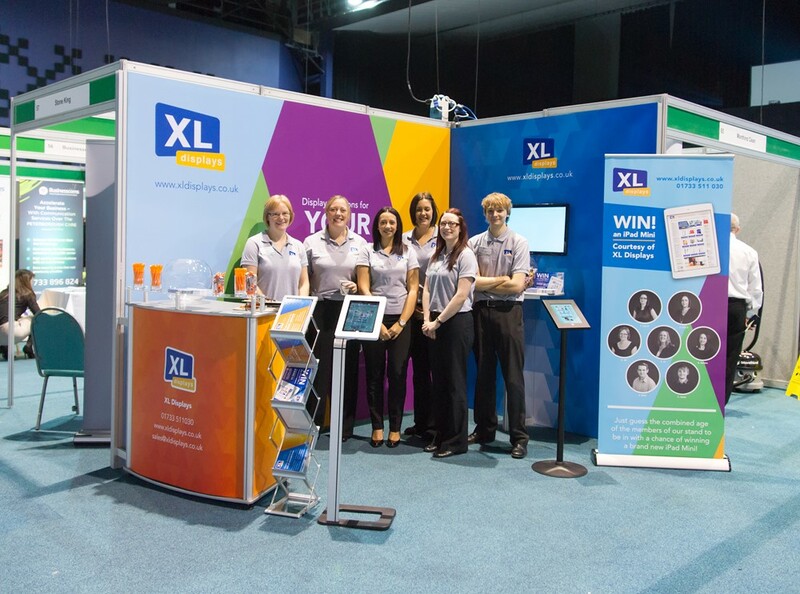 When we exhibited at Peterborough Business to Business exhibition, we held a guess the combined age competition which proved to be very successful. We promoted the competition prior to the event on social media and for the event itself, we designed and printed a roller banner with photos of all seven members of staff who were there throughout the day. Visitors could then look at all the photos and guess our combined age. To enter they had to write their guess on their business card and put it in the pot. The winner was the one who guessed the correct answer or closest to it. This competition was extremely successful and we gained a great presence at the show. Having this need for interaction meant we were able to spend quality time with potential customers visiting our stand. It also had the much-needed element of fun and created a great talking point for the show. We announced the answer and winner on our XL Displays Twitter and Facebook pages. By acquiring each entrant’s business card, we had all the information we needed to make contact the next day. Another great way to increase engagement at an event is with a branded selfie board. At EPS 2017, we took our branded selfie board and got a wide range of event visitors posing with our selfie board and uploading it to social media in exchange for a chocolate sweet. This simple exhibition giveaway idea can be altered and you can offer a competition for the best selfie with the winners winning a prize like a voucher or a freebie. This event competition is great for not only engaging with visitors but also increasing brand awareness both at an event and on social media platforms. For information on how we could help create your own Selfie Board – contact us or call our sales team on 01733 511030.